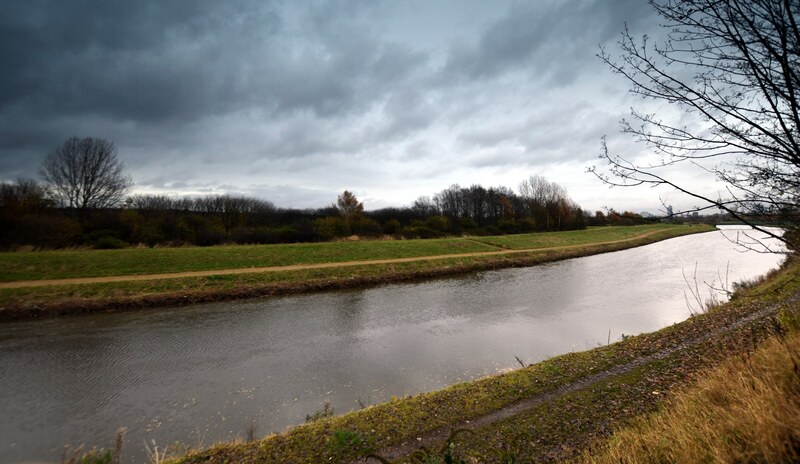 All 7 crewmen and 2 people on the ground were killed when the damaged and bomb laden Lancaster PB304 of 106 Squadron based at RAF Metheringham, Lincolnshire crashed into the opposite bank of the River Irwell here at Pendlebury, Salford on Sunday 30 July 1944. The pilot was attempting to crash land the Lancaster in the playing fields just beyond. EDIT JULY 2015. More photos added showing the bomb damage to Regatta Street and a newspaper appeal. Below; Looking south east towards Manchester. Below; detail from the Salford City Reporter of Friday 5 August 1944. Below; image on display at Yorkshire Air Museum showing the crew positions. The BBC tried to do something similar but chose to use a silhouette of a Halifax bomber taken from an RAF recruitment poster. The brand new Lancaster had been on a bombing raid on German positions at Cahagnes in Normandy in support of British troops on the ground. The attacking force comprised 462 Lancasters, 200 Halifax bombers and 30 Mosquitos but due to cloud covering the target area many were not ordered down through the cloud to bomb at low level and returned to base still carrying their bombs. Moreover, the returning crews could not ditch their bombs in the English Channel due to all the Allied shipping supplying the invading forces. Possibly hit by flak as it circled above the clouds over Normandy, Lancaster PB304 was in trouble as it came in over Manchester on a route back to base at RAF Metheringham in Lincolnshire. 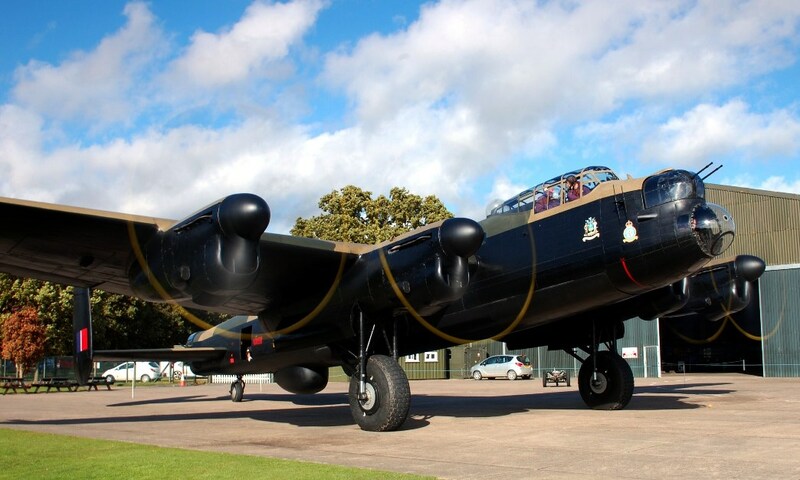 The many witness accounts told of the Lancaster flying low with port engine trouble and attempting to land at the Littleton Road playing fields. The first attempt was aborted and Flight Lieutenant Lines brought the aircraft back round for another attempt. He very nearly made it but a wing clipped the roof tops of houses in Regatta Street and the Lancaster crashed into the far bank of the River Irwell. There was apparently a pause of 30 seconds before the bombs on board exploded. 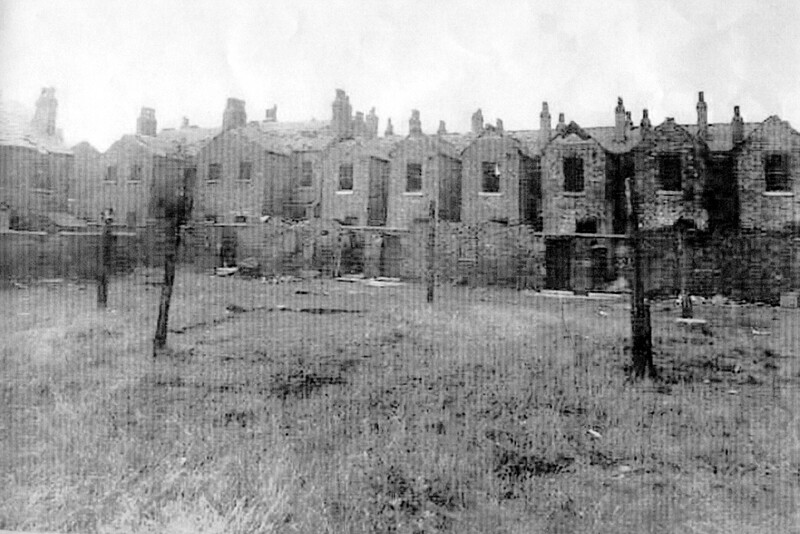 Below; Two photos of Regatta Street after the crash and the bombs exploded, kindly provided by Bob and Beryl. Visiting the scene last week, I spoke with a Regatta Street resident called Beryl. She was just a small child at the time but was able to recall it. 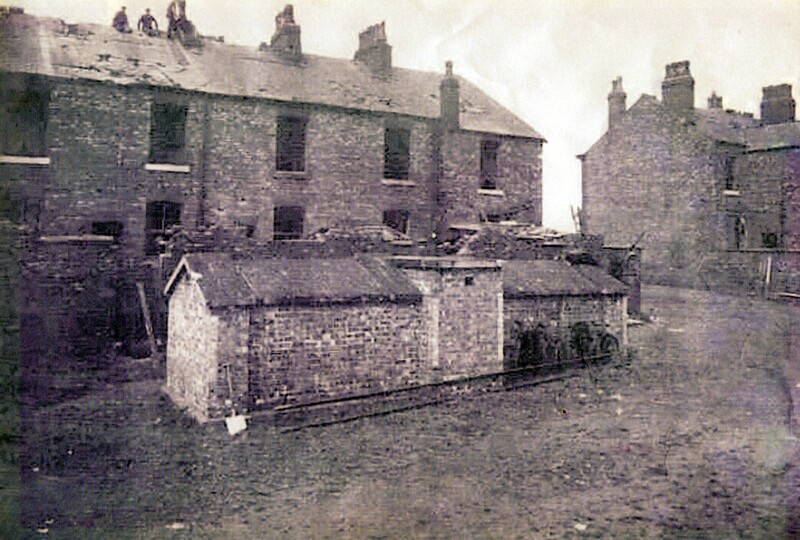 She had been playing out but had just returned to her home when the Lancaster crashed followed by the explosion which demolished a couple of houses in the street. She told me one memory of that was a seat being ripped clean off her bike. Beryl also showed me a framed photo of her home after the incident – all the windows smashed, the walls damaged and part of the roof was missing. The photo above and the poem by J Belshaw of Pendleton, courtesy of Bob and Beryl. Two people on the ground (not one as initially reported) died of injuries caused by the blast; a 45 year old ARP warden, Mr George Morris and 72 years old Mrs Lucy Bamford, both of Pendleton. The Salford City Reporter of August 18 1944 reported on the coroner’s inquiry. Mrs Caroline Morris said her husband had been working in the allotment. Mr Morris had asked his wife to fetch some scissors from the house to cut some roses. As she returned she saw the Lancaster low overhead and thought it was doing stunts. He shouted, “Run for it Carrie!” I ran behind an air raid shelter. There was a loud explosion. I ran home to see whether the children were safe and then ran back to the allotment where I found him lying on the ground. He said his left leg had gone. Mr Morris seemed to be recovering well in hospital but died a few hours later, the cause of death was a pulmonary embolism brought on by the fracture to his leg. The other fatality on the ground was Mrs Lucy Bamford who was at home in Langley Road. She too appeared to recover well and was discharged from hospital but died at her son’s home on August 11. The grandson of Mrs Lucy Bamford has written a book on the subject called the Salford Lancaster. Surprisingly neither Salford nor Eccles library had a copy (and neither had I) and so have had to find other sources for the details presented here. The pilot was Flight Lieutenant Peter Lines from Purley in Surrey and although early into his tour of operations he was considered an exceptionally good pilot. The Wireless Operator was Sergeant Arthur Young from Cardiff. 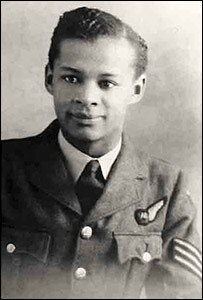 Of Afro-Caribbean descent he was one of the few black airmen at that time. Sergeant Mohand Singh was the Lancaster’s rear gunner and was from the Punjab; he was completing his 22nd operation but in civilian life was a medical student. 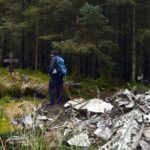 Sergeant Raymond Barnes (Flight Engineer) was local to the area in which PB304 crashed, his home was less than a mile and a half up the road. It is possible he guided Flight Lieutenant Lines to the playing fields. Mid upper gunner Sergeant John Bruce Thornley Davenport was from near Market Drayton in Shropshire. Aged 30 he had been an RAF cook who applied for crew duties and completed a gunnery course. The Bomb Aimer was Flying Officer John Steele, of Bradford. He had reportedly told his family of a premonition he would not survive the month. 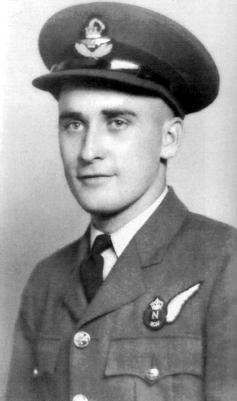 Flying Officer Harry Reid was the navigator and was from Toronto. His parents were from the Orkneys and before the war Harry Reid had been studying maths and physics at the University of Toronto. Picture below of Sergeant Mohand Singh courtesy of his nephew Anil Sood and used with kind permission. 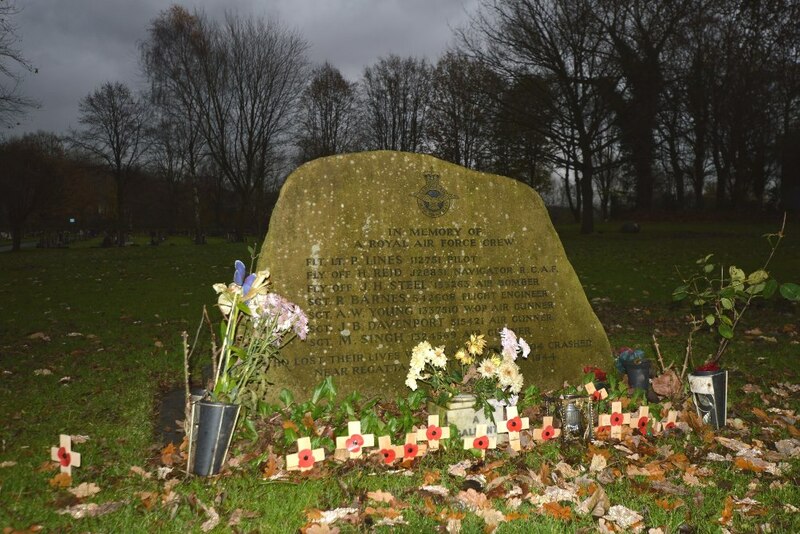 At the nearby Agecroft cemetery there is this memorial. The stone for the monument was donated by a quarry owner from Halifax called Tommy Topham who apparently donated the stone for many war memorials in the UK. 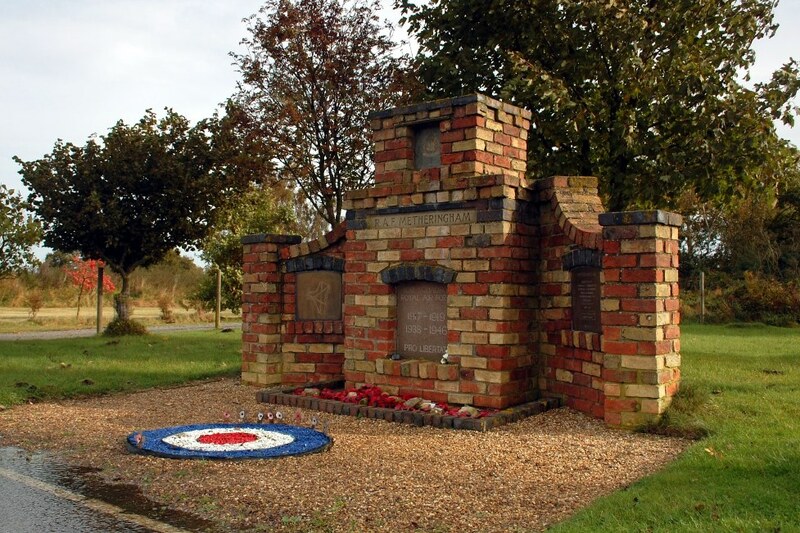 Below; Memorial at RAF Metheringham, photo taken during a brief visit to the airfield. Below; Bombing up a 106 Squadron Lancaster at RAF Metheringham. Photo from wikipedia. Nicely done mate, great that you met the lady with the story. Wonder what he was doing over Manchester on his way to Lincs though? Yeah, curious route from Normandy. Came in from Blackpool which just confuses me more. Must’ve been a good reason for it. Thats an epic tale Ian . Nicely linking quite a few experiences together too . Keep meaning to buy the book ….it occasionally comes up for sale on fleabay . Seen pictures before of Regatta street , but facing toward the water ….one shot carried the claim that the plane came down near a ‘nowadays metal fence surrounding a nowadays garage….dont know how accurate a claim that is of course ! That’s about right, there is a garage on Regatta St if I recall. But the Lanc crossed the river I believe and crashed on the opposite bank. Mind if I had the book it might tell me something completely different, but that was my understanding. It is better remembered than the Halifax which crashed in nearby Blackley a few months later. maybe the Blackley one is one to chase up the details on ? Someone got in touch with me about that one a while back I think… There was not much in the newspaper reports that came as a surprise. Just the Salford one is better remembered. 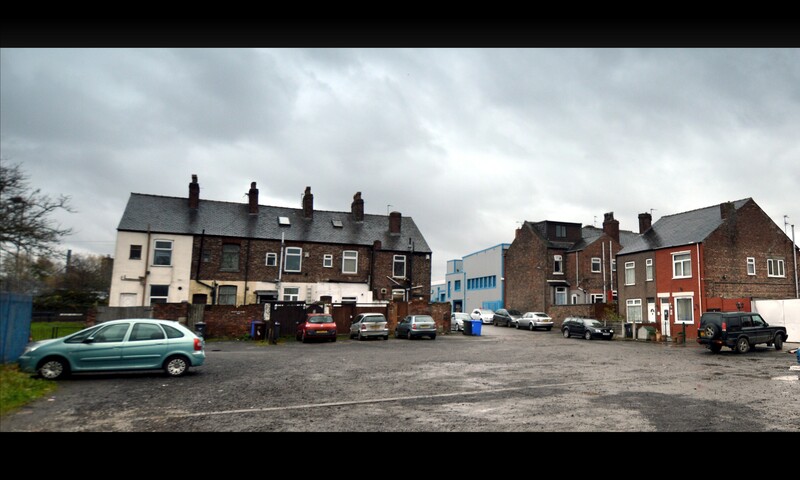 People around Blackley don’t know much of it, at least not the people I spoke with. Came from the west? I think they often routed over the south on raids but that’s unusual? effectively hit. 4 Lancasters lost. Reckon this one would be a good one for a look at the 1180. Not sure why such a convoluted route. I reckon it will all be in the book. Should’ve got a copy before I went! A bad day though, things certainly buggered by the cloud covering the target with the risk of hitting French civilians preventing bombing and ships in the Channel so the bombers had to land with their bombs still on board. For not having the elusive book, as yet, this post is a solid grounding in the event! You even managed to chat with locals that were there [!]. Great variety in pix, nice to have the orientation added [looking south east] as not being local one starts to try to work it out [impossible but still worth a shot]. I also like how you’ve included more links [like the Cranage post] that help your site serve as a stepping stone for people that are interested in particular branches of the history to these events. Thank you very much Ang! You are too kind. Grovelling aside I am puzzled by the route. All I know is that bit about the seas being chock full of supplies for the invasion forces. The RAF were concentrating on bombing Wehrmacht positions in France so presumably that meant more aircraft in the skies coming and going, maybe that was the cause of the return via the north west? Am sure the answer is out there! Hi,heres some photos of the area around Regatta Street from 1949. There is obvious damage to the houses,but i cant see any damage on the river bank.there are a total of eight pictures,some better than others,from the Britain from above site.If you sign in,you can use their zoom facility to get a close look.here is a shot of Regatta street,the link may show the others available,or search Universal metal. Thanks Richard. I shall have to take a closer look to see Regatta St but it is a very interesting site, thanks for the link! 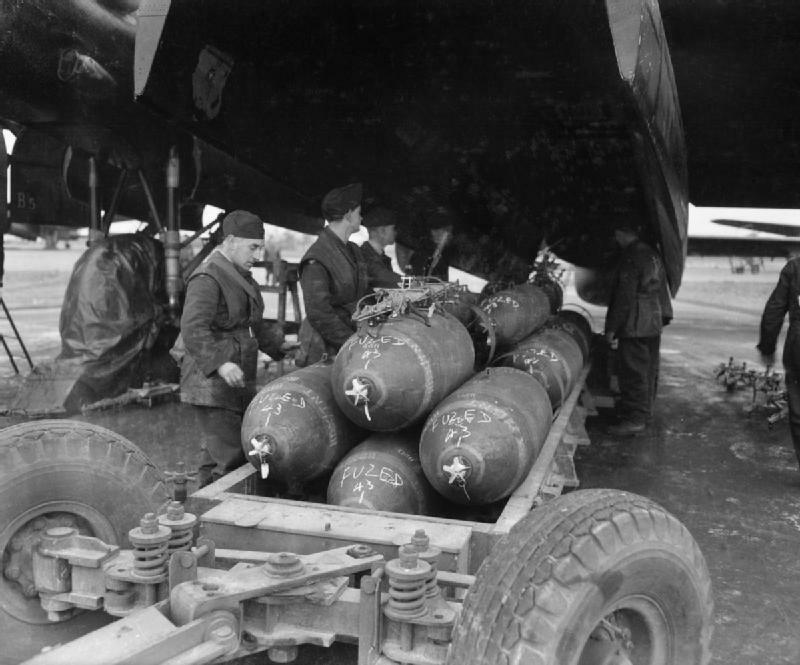 Yes I certainly think that the full load of bombs and the activity in the air at the time, with all that stuff needing to be transported over to the Normandy front will have had some bearing on the decision. Bombers with engine trouble tended to put down at the first airfield they came across. For example, Halifax HR727 crashed on Kinder Scout in the Peak District after being damaged over Frankfurt. If I recall correctly the pilot was criticised for pressing on to reach the base in Yorkshire when he should have put down as soon as possible. Besides, flying over Manchester doesn’t really improve the crews chances of putting down safely. I certainly don’t think they were lost but it is such a peculiar route, there must have been some logic in the planning. I really think it was to ensure the airspace above England was organised like this to avoid mid-air accidents during and after the invasion. I don’t suppose bomber crews having been to Berlin would have been able (because of fuel capacity) to undertake such a route.You have reminded me though, I still need to get that book, am sure that will tell us! Thanks for your visit and comment. It was just a theory. You keep mentioning a book and I’m not too sure which book that would be but I do have a copy of the one titled The Salford Lancaster by Joe Bamford and gave it a quick read over last night(shamefully been sitting in a box of things I’d get around to someday) & your assumption that some answers to the question of why they flew that route home is correct. Apparently as strange as it seems to us now, a number of aircraft took a circuitous route home that day after the orders to abort their missions were given. As a matter of fact it mentions that at least one other aircraft (Wellinton Bomber I believe)landed in Blackpool. Apparently orders were given in the a.m. briefing that they were to return any bombs not used on the target and were, under no circumstances to jettison in the Channel yet it is clearly documented that some did, in fact jettison partial or even full loads. Also apparently orders were sent out that crews were to ” lighten their all-up weights. Who issued the order is most likely unknown and the crews could have interpreted that in one of two ways, to either jettison their load or to burn off fuel, explaining the routes many of them took while they waited for the weather to clear. The weather (low cloud cover/poor visibility)that day played a large part in decisions that were made both by the Master Bomber and the crews flying the aircraft. There were also reports of poor communications which could have further increased the confusion of some of the crews.I shall put aside some time over the next couple of weeks and read through the book in more detail, maybe have better answers then. Yes, the flight officer was my uncle. His brother, a career officer in the RCAF, was my father. Although I did not come along until many many years after WWII I’ve always been well aware of the crash. The book is readily available on Amazon. All of your answers are in it. Heard about this crash on Radio Manchester this morning. They spoke to Joe Bamford about the local connection with one of the crew. I used to live in Eccles, most probably read the book, but had not seen anything about it until the radio programme this morning. The booK is available on Amazon. I did hear of a Lancaster making a landing at Barton Aerodrome(now City Airport Manchester),on a training flight. How true it is I am not sure but the comment was it was a close thing on the take off. 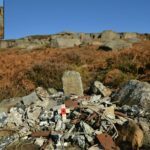 Very interesting website, I used to work in Swinton 30 years ago and was unaware of the story and I used to drive past the crash site on my way home. I read the book and found it to be an excellent account. I thought aicraft returning with their bomb loads were forbidden to land with them on board. Thanks Tony. By this stage of the war it was normal for bombers to ditch unused bombs in the sea (rather than over Occupied Europe). It seems the amount of invasion traffic in the English Channel meant returning bombers had to bring their unused payloads home with them at this time, a highly dangerous thing to do. I’me 86 years old. I lived on New Cross St Weaste at the time of the crash(about a kilomere from the crash site). I remember that Sunday morning a loud bang that rattled our windows. I rode my bike in the direction of the bang and found a crew boarding up broken windows around Littleton Rd, but no other sign of damage. Hi John, glad to be of service! The major news at the time was the Battle of Normandy. The bomber crash report must have been buried on the inside pages, also, wartime censorship applied (for example when Manchester got Blitzed the papers said it was a North West town) No wander I didn’t know what happened. I saw this plane crash. 12 years old at the time and playing in the field alongside the A666, Bolton Rd, Pendlebury. I lived at No 124. I and two pals saw the plane, low and an engine banging and miss-firing. As it disappeared over the railway embankment we raced up the bank and watched the plane lose height before hitting the far bank of the Irewell with an enormous explosion. It’s direction was due west as we saw it pass over Waverley Road, Pendlebury and it crashed opposite Regatta Road. I think the guesses were right that the pilot was making for the open playing field area. With a full bomb load it would be a gamble anyway. Until now I never heard the details of the crash. During the war news of local bombing, numbers killed and property destroyed, especially factories, was only by word of mouth and limited. As the poster said’Careless Talk Costs Lives’. We could only go to bomb sites after casualties and dead had been removed. They were still not safe but as youngsters we had a trade in German bomb fragments and would dig in any crater. Scary times really and perhaps not fully appreciated these days. Sorry. Direction was to the East. Hi Cliff, good to hear from you. Thank you for adding your memories of this crash to this page. It’s always a pleasure to hear from the people who were there. It was a terrible event you witnessed but I’m pleased you have been able to find a little more about it now, albeit 72 years on! Great to hear your story, Cliff. Will you be attending the memorial at Agecroft on Sunday 26th July? Sorry Steve, I won’t be able to make it this Sunday. Hi Cliff, hope you are well. Your account of the crash sounds fascinating as there’s not many around people now who could recall this. Would it be possible to speak to you about what you remember? After a couple of years looking into this I have a couple of questions that I’m struggling to find answers to, so any help would be great. Hi Bob, it’s very good to hear from you. Thank you for adding your memory of the crash to this page, I always appreciate it when the people who were there add to these pages, it is priceless testimony. 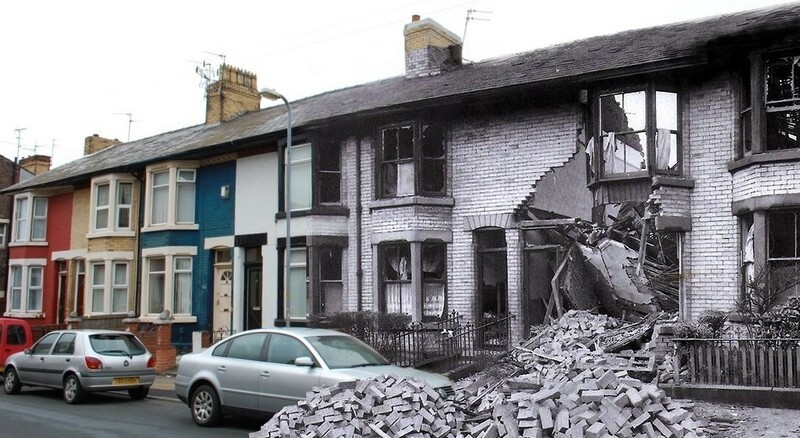 Your neighbour clearly thought the Luftwaffe had returned to Salford, 3 years after the air raids. Please give my regards to Beryl. Great to hear your story, Bob. I have done a lot of digging and research into this as I always knew a Lancaster crashed in the vicinity but only found out more about it last year. Will you, or anyone here, be attending the memorial at Agecroft on Sunday 26th July? It would be great to speak to you, or anyone who remembers this incident or knows more about it. Just finished reading the book today. Very well researched and a fitting tribute to the aircrew and civilians who sadly lost their lives. No mention of the possibility of making an emergency landing at Burtonwood though. Hi Stephen, have recently been in touch with someone who was there at the time and he has sent me a few more images which I will add to this page in a day or so. 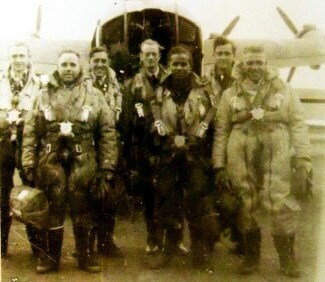 Just found this site just like to thank all you people for keeping the memory of these crewmen alive .. Being a relative of A Young I am very proud of him and his fellow flight crew as their Bravery is really hard to comprehend. Hi Carl, thanks for visiting and adding a comment, it’s very good to hear from you. 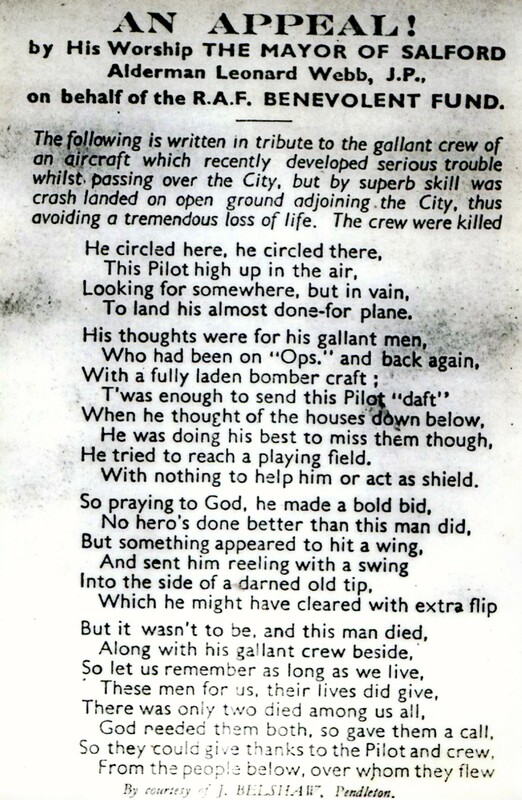 Agree it is hard to understand the courage that makes a young man join an RAF bomber crew when his chances of surviving a tour of 30 operations was around 1 in 6. Read the book The Salford Lancaster some years ago as we have a connection to the story not mentioned in the book. After the plane crashed the air ministry couldn’t send anyone to the site to remove the guns and ammunition not destroyed in the explosion until the following day. A police man was there after the crash, but during the evening they called in a member of the home guard to keep anyone away from the site until next day when the ministry arrived. The person who was posted to guard the wreckage was my grandfather Thomas Berry, born 1891. The reason he got the job was because he was the only member of the home guard unit with a gun. It was a .22 air rifle!!! Typical DAD’S ARMY he would have probably have been better off shouting bang! Great anecdote about your granddad Martyn, thanks for adding it to the story. Hi. Stumbled across this site and I am impressed. Great work. I was looking for info on this crash, as my father witnessed the Lancaster flying over. He described the engine trouble etc and that he heard the explosion. He lived in Levens Street, near Douglas green at the time, and told me about the crater behind regatta street, as he played there after the war with friends. Thank you very much, glad you found what you were looking for. Hi, thank you for visiting and adding your memories of this crash. You were young but it obviously made an impression! I remember the 1944 plane crash like it was yesterday. We lived on Littleton Rd. My sister was upstairs and saw the plane and she thought it going to crash on our house and started screaming. The noise of the plane coming down was terrifying and then the explosion. We spent our childhood in air raid shelter since the Blitz so we thought it was a German plane attacking. It must have been terrifying! I read the book some years ago, just note down the ISBN and order it from the library. Is that a crater or part of the eroded river bank? I thought PB304 crashed on the opposite bank? Interesting photos of Regatta St.
You can recreate her view from the kitchen window on google street view too. Sharp above also mentions coming over the (Jubilee) footbridge from Littleton Rd. I think witnesses in the book mention coming over the bridge too. email me at prestwichsloopygmail.com and I’ll send you some more info. Hello. My name is Brian Worts and my dad Alf did 31 ops in Lancasters. 1100 hours recorded. He told me once about a return flight across “the ditch” at low level when a engine had been damaged. There was a term he used for flying low near the water. Does anyone know what it was please? I think your Father was referring to the Manchester Ship Canal, I read it in a book some years ago that some merchant sailors called it that ? More likely the North Sea if they had been bombing Germany Brian or the English Channel if they had been bombing in France most probably after D Day. Any stretch of water was colloquially known as “the ditch”. Vivid memories there John, thank you very much for taking the time to share them and record them here. 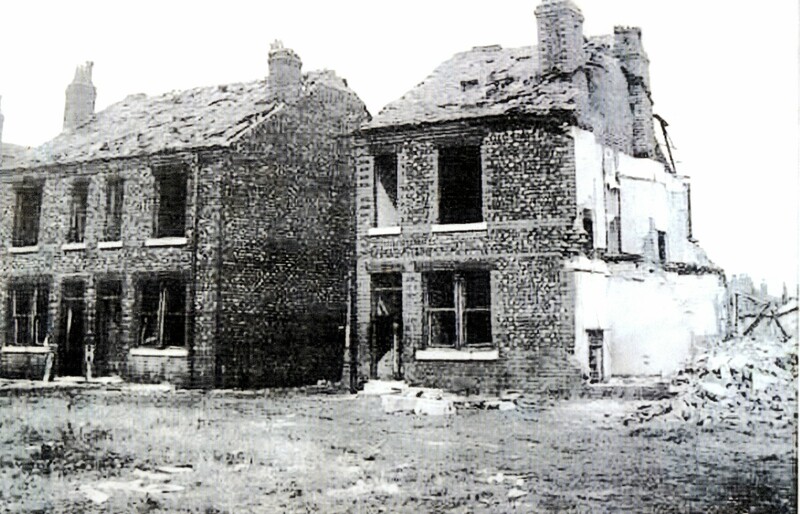 Myb Mother and Grandparents lived at 42 Langley Rd when this happened. My Grandad was injured by flying broken window glass (he’s listed as injured in the book). I was born in 46 and visited my Grandparents at 42 Langley rd every Sunday. I was always told that the Aircraft had crashed into 2 houses in Regatta St at the rear of what was then “Florries’ shop (now a sandwich shop). PS My Grandads name was Joseph Dudley. Steve thanks for the contact. I would be pleased to meet/correspond re the air Crash. I live in Timperley, Cheshire if that helps. Hi Cliff, that would be fantastic. Could you drop me an email at steve . worsley @ live.co. uk (without the spaces)? Flight Lieutenant Peter Lines trained in the USA and he was on the same course as the last ‘British Dam Buster’ George ‘Johnny’ Johnson. Johnny was a good friend of Peters. Sgt. 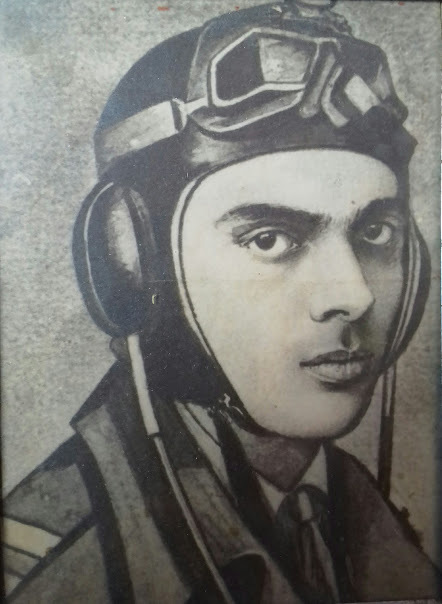 Mohan Singh,the gunner, was my mums younger brother whose framed picture graces my drawing room along with an imaginary oil painting of the Lancaster with one engine running, over waters, and about to crash which my mother had done over fifty years ago here in India.His belongings along with a citation were all sent back to us and I had his kerchief with the RAF insignia. Good to hear from you Anil and that you remember your uncle and his pals. Be great to add any photos you have to this page? Or a photo of the painting? I was researching some material about Lancaster PB 304 and Sgt Mohan Singh, your uncle. My email is tonysarao@gmail.com. I am a military historian. I need to contact you and obtain more information for my research. Hi Anil, thank you for sharing those pictures. I have edited this page to include the portrait of Sgt Singh. It is sad your mum never got to know what is known now, but it is good that he is not forgotten in your family. It’s good to add to these stories, so thank you again for the photos and your comments. This is a link to Regatta Street on Google. It is a few miles north of Manchester United’s home at Old Trafford. many thanks for sharing. So poignant seeing Mohan looking out of the ailng aircraft. Ian,the picture of Mohan Singh is an artists impression not a true photograph. That 1949 photo is fascinating, thanks Bob. The Lancaster came down in a direct line with Sth Radford street. 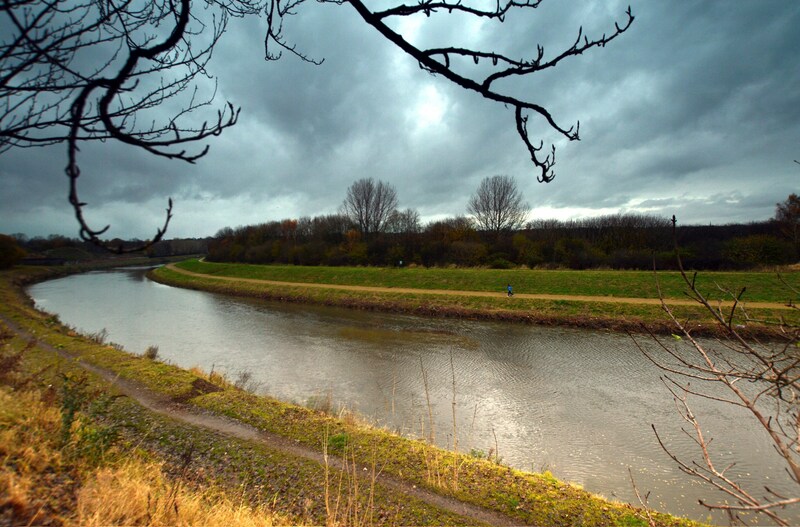 passed overhead.It crossed over the playing field and hit the opposite bank of the River Irwell. Mother thought there was an air raid and shouted for me to come inside. My sisters appeared and with many others ran across the playing field to see what they see. The field was covered in piles of stones apparently to discourage enemy aircraft landing, so this was, I was told, why the Lancaster could not land. The field was used then to graze horses which were going berserk. Some of the sightseers had lucky escapes from the charging frantic horses. Hi David, great recollection and addition to the story. Out of interest when you saw the Lancaster pass overhead, was it traveling in the direction of Langley Road from the Kersal side, or vice versa? Did you see it bank round to adjust course at all? I guess it may be a long shot but could you make out any squadron lettering on the fuselage or what colour this was? Reason for asking is I keep a replica of this aircraft as a tribute and would like it to be as accurate as possible. This is my first book and has been published and distributed Nationally and Worldwide by the History Press with forward from Dame Vera Lynn. In my book are 42 stories of World War Two Veterans who I have interviewed from all over the country from all services, and includes British and various other nationalities. I am a local author and I am now finishing the last interviews for my next book and really want to include the story of PB 304 so that I have a really local story included in the book. If anyone out there knows anyone who witnessed the crash I would really like to speak to them, after reading the comments on this page and if anyone knows David Fox or John Hewart that would be great. Also if the Author Joe Bamford or anyone who knows how to reach him could get in touch with me that would be fantastic. I believe you’ve spoken to my partner Lucy regarding this (I was the one who found your note on the Lancaster’s memorial at Agecroft). I can get in touch with Joe Bamford if he hasn’t already seen your post, I will check whether he’ll be attending the memorial service next month also. There are some interesting accounts to be read about this incident and some of them do carry conflicting information. However after 74 years details will be very sketchy. I met and spoke with Cliff Carr (who posted on this page) who was a young lad who lived off Bolton Road at the top of Agecroft Road at the time, so his recollection was from the opposite perspective. Joe’s book is a good read and along with some of the comments posted here, it probably gives the best picture of the event we can imagine now. My mum, aged about 6 at the time lived in Sutton Flats she recently told me her and her auntie Ivy ran onto the street and saw the plane clipping chimneys, she said the plane was so low it was like you could touch it. My Mum, Barbara Jones aged 13 at the time, daughter of Alfred Atherton owner of the corner shop which was also destroyed knew Berol mentioned in the story above. Mum has just told me the whole story, still alive and well at 86, its amazing. There is always a memorial service on the last Sunday of July at the Agecroft memorial stone. We have submitted a flypast application to the BBMF but I for one haven’t had any form of response. BBC Breakfast will be showing the Sheffield flypast live in honour of the “Mi Amigo” B-17 tomorrow morning. This event will also be in honour of all RAF and other nations that lost flight crew.